NOT since the era of imperial Rome has the “thumbs-up” sign been such a potent and public symbol of power. A mere 12 years after it was founded, Facebook is a great empire with a vast population, immense wealth, a charismatic leader, and mind-boggling reach and influence. The world’s largest social network has 1.6 billion users, a billion of whom use it every day for an average of over 20 minutes each. In the Western world, Facebook accounts for the largest share of the most popular activity (social networking) on the most widely used computing devices (smartphones); its various apps account for 30% of mobile internet use by Americans. 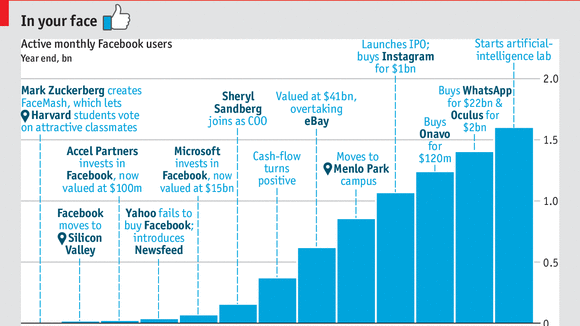 And it is the sixth-most-valuable public company on Earth, worth some $325 billion. 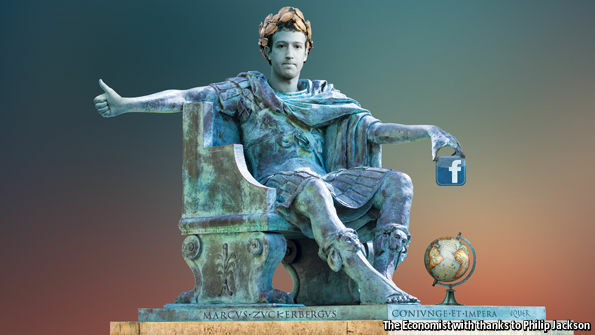 Even so, Mark Zuckerberg, Facebook’s 31-year-old founder and chief executive, has even greater ambitions. He has plans to connect the digitally unconnected in poor countries by beaming internet signals from solar-powered drones, and is making big bets on artificial intelligence (AI), “chatbots” and virtual reality (VR). This bid for dominance will bring him into increasing conflict with the other great empires of the technology world, and Google in particular. The ensuing battle will shape the digital future for everyone. Facebook has prospered by building compelling services that attract large audiences, whose attention can then be sold to advertisers. The same is true of Google. The two play different roles in their users’ lives: Google has masses of data about the world, whereas Facebook knows about you and your friends; you go to Google to get things done, but turn to Facebook when you have time to kill. Yet their positions of dominance and their strategies are becoming remarkably similar. Unparalleled troves of data make both firms difficult to challenge and immensely profitable, giving them the wealth to make bold bets and to deal with potential competitors by buying them. And both firms crave more users and more data—which, for all the do-gooding rhetoric, explains why they are both so interested in extending internet access in the developing world, using drones or, in Google’s case, giant balloons. The task is to harness data to offer new services and make money in new ways. Facebook’s bet on AI is a recognition that “machine learning”—in which software learns by crunching data, rather than having to be explicitly programmed—is a big part of the answer. It already uses AI techniques to identify people in photos, for example, and to decide which status updates and ads to show to each user. Facebook is also pushing into AI-powered digital assistants and chatbot programs which interact with users via short messages. Next week it is expected to open up its Messenger service (which can already be used to do things like order an Uber car), to broaden the range of chatbots. And Facebook’s investment in VR—it bought Oculus, the cheerleader of this emerging field, for $2 billion in 2014—is a bold guess about where computing and communication will go after the smartphone. But Facebook faces rivals in all these areas. Google is using AI techniques to improve its internet services and guide self-driving cars, and other industry giants are also investing heavily in AI—though with the deepest pockets and the most data to crunch, Facebook and Google can attract the best researchers and most promising startups. Facebook lags behind Amazon, Apple, Google and Microsoft when it comes to voice-driven personal assistants; when it comes to chatbots, it faces competition from Microsoft and a host of startups eager to prove that bots are the new apps. And its push into VR—which Mr Zuckerberg sees as a stepping stone to “augmented reality” (AR), where information is superimposed on the real world—pits it against formidable rivals, too. Microsoft has jumped straight to AR with its HoloLens headset, its most impressive product in years, and Google, already active in VR, has invested in Magic Leap, a little-known AR startup. The scale of Facebook’s ambition, and the rivalries it faces, reflect a consensus that these technologies will transform how people interact with each other, with data and with their surroundings. AI will help devices and services anticipate your needs (Google’s Inbox app already suggests replies to your e-mails). Conversational interfaces will let you look things up and get things done by chatting to a machine by voice or text. And intelligent services will spread into a plethora of products, such as wearable devices, cars and VR/AR goggles. In a decade’s time computing seems likely to take the form of AR interfaces mediated by AI, using gestures and speech for inputs and the whole world as its display. Information will be painted onto the world around you, making possible new forms of communication, creativity and collaboration. This is the ambitious vision that Facebook, Google, Microsoft and other technology giants are working towards. But along the way there are certain to be privacy and security concerns. Crunching all that information to provide personalised services looks a lot like surveillance, and will cause a backlash if consumers do not feel they are getting a good deal in return for handing over their personal details (as the advertising industry is discovering to its cost)—or if security is inadequate. There will also be worries about concentration and monopoly, and the danger of closed ecosystems that make it hard for people to switch between services. Facebook’s plan to offer free access to a limited subset of websites was blocked by India’s telecoms regulator, which argued that it was “risky” to allow one company to act as a gatekeeper. And Germany’s competition authority is investigating the way Facebook handles personal data. As its dominance grows, Facebook can expect to face more such cases, as Microsoft and Google did before it. Striking a balance between becoming ever more intimately entwined in billions of peoples’ lives, making huge profits as a result and avoiding a backlash will be one of the biggest business challenges of the century. Even in ancient Rome, emperors could find that the crowd suddenly turned against them. So applaud Mr Zuckerberg—and fear for him, too. It seemed exaggerated at the time. But when Europeans fretted that Barack Obama’s election would mean a waning US interest in Europe they were not far wrong. Mr Obama was America’s first Pacific president, which also made him its first non-Atlantic one. His pivot to Asia need not have been a pivot away from Europe — but that is how it has turned out. If there were any doubt Mr Obama’s priorities lay beyond Europe (and the Middle East), they have been put to rest in the past year. Can whomever succeeds him revive the Atlantic alliance? For that matter, how much of one will he bequeath? The answer is a rapidly moving target. Eight months ago Europe finally seemed to have answered Henry Kissinger’s quandary about whom to telephone. That was Angela Merkel. The US intelligence services admittedly took that too literally by eavesdropping on Ms Merkel’s calls. But it was clear who was in charge. Others were prepared to follow her. All that is now moot. Following Ms Merkel’s decision to open Germany’s doors to Syrian refugees, even domestic allies have distanced themselves from her — not to mention neighbours, such as Austria, Poland and France, which explicitly repudiated her move. As a result, the already strained European project hangs in the balance. Does America care? If you canvass its foreign policy establishment — the administrations-in-waiting that populate the Brookings Institution, the Council on Foreign Relations and elsewhere — the answer is a strong yes. US bipartisan elites have always backed the transatlantic alliance, which they still see as the cornerstone of the US-led global order. But think-tanks are so 20th century. Politicians no longer hold the same degree of respect for them. Obama officials refer to Washington’s Massachusetts Avenue, the home of many of them, as “Arab-occupied territory”, because of the level of Gulf money they solicit. Some of those hoping to succeed Mr Obama, including Donald Trump, who would be happy for the US to walk away from Nato, have barely set foot in one. Among the other candidates, only Hillary Clinton and John Kasich, the Ohio governor, fit the traditional mould. Their campaigns are advised by many of the familiar names in waiting. Even they, however, would agree with Mr Obama’s frustration over Europe’s “free riders”. For all her Atlanticism, it is not clear whether a Hillary Clinton administration would mark a big change from Mr Obama. There are two big obstacles to reviving the west as we knew it. The first is the crisis in Syria. It is hard to find anyone on either side of the Atlantic who believes last month’s deal between Turkey and the EU will survive 2016. Turkey’s agreement to stem the flow of Syrian refugees to Europe is based on the pretence its citizens will be given visa-free travel to Europe, and that EU accession talks will be revived. Once both fictions are unmasked, Turkey will be tempted to turn the refugee spigot back on. If there were any doubts in the US that Recep Tayyip Erdogan, Turkey’s president, is an autocrat, they were dispelled at the Brookings Institution last week when his bodyguards manhandled journalists critical of his regime. There is no chance Turkey will be invited to join the EU. Nor should there be. Which puts the spotlight back on the US. No matter how hard John Kerry, the US secretary of state, tries to broker a diplomatic solution to Syria’s civil war, it is outweighed by Mr Obama’s lack of interest. Without strong White House support, Mr Kerry’s mission is quixotic. Mr Obama’s reluctance to put US troops in Syria is understandable. But he could have tried other things. For example, taking more Syrian refugees would have given him greater moral traction to sway collective action in Europe. The US has only processed 1,300 of the 10,000 Syrians that he pledged to take last year. He is unlikely to meet that target before leaving office. Last week, the Obama administration gave $10m to the UN Syrian refugee effort, which is less than the cost of a US missile strike. It is possible Mrs Clinton would be more activist than Mr Obama. But she would also be limited by public opinion. For the time being Europe cannot look to Washington to fix Syria. Nor is it capable of doing so on its own. The second obstacle is surging populism on both sides of the Atlantic. Whether it is Britain’s EU Leave campaign, Marine Le Pen’s strong poll lead over French president François Hollande, or the rise of Mr Trump in the US, the momentum is away from “the west” as we have understood it. It is no secret that Vladimir Putin, the Russian president, would like Britain to leave the EU, supports Ms Le Pen and returns Mr Trump’s admiration. It is an open question how long Europe will be able to maintain its post-Crimea sanctions on Russia. It is worth recalling that it was Ms Merkel — not Mr Obama — who was instrumental in putting them in place. Nowadays, moreover, it is Russia, not the US, that is the prime mover on Syria. US generals have testified that Russia’s bombing of Aleppo and elsewhere is deliberately “weaponising refugees” to weaken Europe. So far Russia’s repugnant strategy seems to be working. But it is a strategy. The problem facing the west — if that term holds — is that it still lacks anything resembling one. Emerging Markets in the Sweet Spot: Can It Last? Emerging-market investors have finally caught a break. Currencies, bonds and stocks have rallied; money has been flowing in. But some of the foundations for optimism are fragile. The sighs of relief from fund managers are justifiable. Pessimism on the asset class had been overdone, and emerging markets have got some of their mojo back. Year to date, the MSCI Emerging Market index is up 2.4%, outpacing the developed-market World index, down 2.7%. Exchange rates have rebounded, with the Brazilian real up 7.6% against the dollar, the Russian ruble up 6.4% and the Turkish lira up 2.4%. Local-currency and dollar-denominated emerging-market bonds have gained. In March, portfolio flows into emerging markets hit a 21-month high at $36.8 billion, the Institute of International Finance estimates. J.P. Morgan JPM -0.38 % says investors added the most to positions in local-currency bonds and emerging-market foreign exchange since it started surveying them in 2001. But a chunk of this welcome relief has come about because of central-bank actions in developed markets, and in particular the apparent unwillingness of the U.S. Federal Reserve to raise interest rates by as much as feared. A weaker dollar has generated breathing space. Looser U.S. monetary policy relative to expectations gives emerging-market central bankers additional room for maneuver as the downward pressure on their currencies eases. The monetary-policy detente has also smoothed the path of markets, encouraging risk appetite. 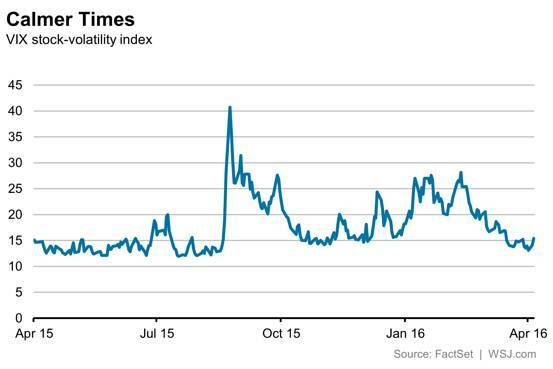 The VIX stock-volatility index last week reached a low not seen since mid-2015, before China’s botched currency shift sparked panic among investors. But to the extent monetary policy is once again suppressing volatility, it is simply delaying the day of reckoning. Emerging markets aren’t relying entirely on the kindness of strangers. Fears of a Chinese devaluation have eased, with some clearer communication from policy makers. 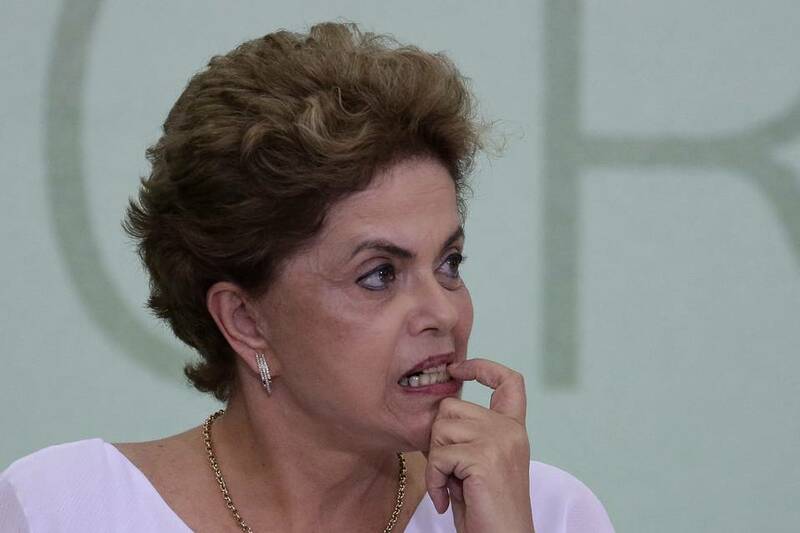 Investors are hoping for political change in Brazil as President Dilma Rousseff’s government teeters. Russia, although damaged by generating geopolitical instability, has won confidence from investors for its handling of the oil-price shock. And in the coming months, the focus of worries for global investors may move back to Europe. Greece is edging back onto the agenda, and the U.K.’s European Union vote is also causing jitters. Emerging markets might benefit from not topping the list of investor concerns. But for a true recovery in emerging markets, investors will need to see greater evidence of sustainable growth and reform. To the extent that this latest shift is as a result of adjustments in global exchange rates and U.S. interest-rate expectations, it is vulnerable to a reversal. Even an acceleration in U.S. growth can become a problem: it will probably lead markets to tighten global financial conditions in anticipation of a less accommodative tone from the Fed. A world in which a stronger U.S. recovery is a worry is one that doesn’t inspire lasting confidence that emerging markets are fully out of the woods. The sweet spot can’t last forever. - According to industry analysts, gold production peaked in 2015 and will drop starting in 2016. - Year end gold reserve reports confirm that miners are not replacing currently mined gold. - Slashed exploration budgets signal that without a miraculous set of discoveries, there is no reason to believe that current reserves will be replaced in 2016. It is the beginning of 2016 and now is the time when gold mining companies issue their year-end gold reserves, which give investors a glimpse into future production. 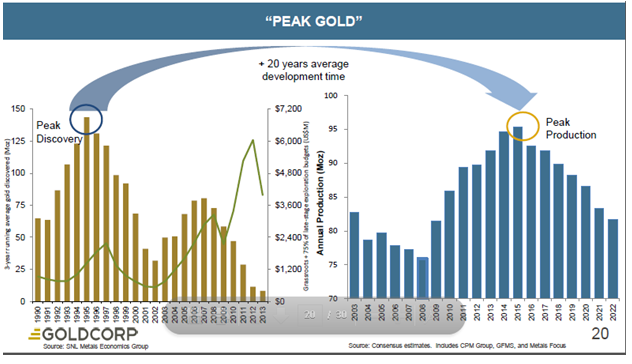 As we have mentioned before, we think this is very important because we believe that gold production will fall drastically over the next decade without significantly higher prices - without declining production the thesis doesn't hold. We are bullish long-term on gold because as investors can see, companies that analyze the industry (CPM Group, GFMS, Metals Focus, etc) are predicting a huge drop-off starting in 2016. This drop almost exactly mirrors the fall in discoveries over a 20 year lag period (the time to develop and permit mining) - all very logical. While we may be bearish in the short-term as speculators are significantly overweighted in their gold positions, for the long-term gold makes an excellent investment. In fact, if the "Peak Gold" scenario plays out, then we can expect a much higher gold price as production drops while the world's money supply increases (and this is ignoring any increase in demand from developing nations as their populations get more affluent). But how do we verify that this is what we are seeing? So what we did is compile some of the reserve reports of some of the top gold producers: Newmont (NYSE:NEM), Barrick (NYSE:ABX), Goldcorp , Kinross (NYSE:KGC), and Agnico Eagle (NYSE:AEM). In fact, the only miner that increased reserves was Agnico Eagle , and that was due to its acquisition of Osisko which added 4.3 million reserve ounces - without that acquisition it too would have seen a decline in gold reserves. In 2015, we saw more of the same as reserves dropped by close to 20 million ounces, less than the drop in 2014, but certainly sizable. Additionally, every single major miner shown above saw reserve declines. We want to stress that this is NOT healthy and normal as the mining industry needs to replace gold reserves every year to stay viable and continue to produce. What we SHOULD see is reserves either growing or at least flat reserves, without that it means that future production will almost certainly drop - which plays very well with our thesis on future gold production. Investing in gold by buying and holding gold (and their paper equivalent the gold ETFs (GLD, CEF, PHYS), is the most conservative approach as we will probably see a much higher gold price or much less gold production - both positives for an investment in gold. This is not a complicated trade and everything which we've said so far has nothing to do with the many other catalysts that we write about on a regular basis (such as the US fiscal position, the battle between bondholders and the Fed, increase in central bank purchases of gold, or the deteriorating world order). In fact, even the supposed improvement in the US economic picture (the main reason investment banks forecast a falling gold price) would still have no effect on this much more important fundamental issue. Finally we come to the developers and explorers, where we think the real opportunity for massive gains is to be realized. Investors have to be careful here too because many of them have projects that may never be economic, but those companies that do have quality deposits will make excellent takeover targets for the majors as production and reserves fall. Of course, if somehow the stunning growth in worldwide debt catches up with the global economy - all bets are off and we could see a gold price many multiples of what we have today. 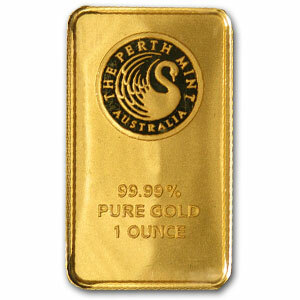 There are very few no-brainer investments out there, but gold seems to be one of them and for patient investors this is a great time to buy. Following the attacks in Brussels, calls are growing for European intelligence services to work together more closely. But cooperation is difficult because Germany's secret service has little trust in its EU partners, and has even spied on them. The man who wants to explain the psyche of Germany's foreign intelligence service is sipping a cappuccino and talking about the abduction of German tourists in the Sahara Desert a few years ago. A crisis committee was meeting at the Foreign Ministry in Berlin, and agents at the Federal Intelligence Service (BND) in Pullach, outside Munich, were trying to figure out how to get information about the kidnappers. Human lives were at stake, the pressure considerable. The French intelligence services had good sources in the region, but they were unwilling to share their information with the Germans, so the BND decided to spy on the French to gain access to it. This was how it came about that the Germans spied on a government agency in a friendly country, one they treated as one of their closest political allies. Friendly? Allied? These are not categories with which the man with the cappuccino is familiar in his work. A senior BND official at the time, he prefers to keep his name a secret. He recounts the episode to explain why an intelligence service sometimes finds it necessary to spy on one of its partners -- and how it could happen that the BND spied on so many institutions in Europe. Our business, says the man, is based primarily on suspicion. There was talk of a community of values, of solidarity and of trust. German Interior Minister Thomas de Maizière, a member of the center-right Christian Democratic Union (CDU), mentioned various "pots of data" and the need to finally link them together. Federal Prosecutor General Peter Frank and the domestic policy spokesman of the center-left Social Democratic Party (SPD) parliamentary group, Burkhard Lischka, called for a European counterterrorism center. Politicians and others have been singing the same mantra for months, and it always happens when there has been an attack. It happened in November, after the attacks on the Stade de France stadium and the Bataclan concert hall in Paris, and before that, in January, on the editorial officials of the French satirical magazine Charlie Hebdo. The argument makes sense: If terrorists are forming cross-border networks, governments must do the same to fight terrorists. Nevertheless, cooperation among security agencies in Europe remains rudimentary. The episode in the Sahara illustrates why this is true. Intelligence services mistrust rather than trust each other. Data is hoarded instead of shared. Everyone spies on everyone else, as we have learned from past revelations. The American National Security Agency (NSA) tapped German Chancellor Angela Merkel's mobile phone, and the BND spied on former French Foreign Minister Laurent Fabius. The examples could be continued indefinitely. For months, the German government has been working on a law to reform the country's intelligence agencies. Its aim is to improve transparency and eliminate mistrust, especially of European partners. But the suspicion is deeply entrenched, as evidenced by the thousands of spying targets, known as selectors, the BND has directed at European neighbors. They consist of long sequences of letters and characters. The sequence begins with a telephone number, email address or number of a device the BND wishes to spy on, followed by a code for the subject matter: "WPR" for weapons production, "LAP" for agricultural policy, "TEF" for funding of terrorism, "ISG" for an Islamist who poses a potential threat to public safety. Then comes a three-letter code for the country where the spying occurs. The sequence often ends with a blocking code to identify intelligence services with which the Germans prefer not to share the results of the spying operation: HORT for Hortensie (hydrangea), for example, the code for the United States, and BEGO for Begonia, the code for Denmark. The BND employees referred to the services of other countries as Fleurop partners (which stands for the Europe-wide online flower delivery service of the same name). Many of the BND selectors included blocking codes, a sign of how deeply the Germans mistrusted these agencies. The selectors open a window into the world of BND espionage, revealing how pronounced the German agents' desire to gather information was. To some extent, they used the same terms to search the worldwide sea of data as their counterparts from the United States. The overlap encompassed many areas, including politics and business, government agencies and private citizens. The BND was snooping around in crisis zones, but also in countries like the United States. European neighbors were targets of its espionage with remarkable frequency. For instance, the email addresses, telephone and fax numbers of virtually all European embassies and many consulates in Germany were on this target list, and the agents didn't even shy away from spying on a Vatican delegation. The list also included phone numbers for the interior ministries in Vienna and Brussels, the Defense Ministry in London and the US State Department, as well as banks like HSBC. International institutions were on the list of targets, as well as the United Nations drug control program, the Organization for Security and Co-operation in Europe (OSCE), the Organization of the Petroleum Exporting Countries (OPEC) and the International Monetary Fund in Washington. So were non-governmental organizations, such as Oxfam, Care International, the International Committee of the Red Cross in Vienna, the International Medical Corps in Los Angeles and the International Action Center in New York. The offices of politicians were also wiretapped, such as that of the Israeli prime minister, along with telecommunications companies like British Telecom and MCI Worldcom, a NASA flight operations center, a department of the US Air Force, and many small and mid-sized companies in Austria and Switzerland, even gun manufacturer Heckler & Koch in the southwestern German state of Baden-Württemberg, which was British-owned at the time it was spied on. At the beginning of the espionage scandal, it seemed that the BND was mainly gathering information about European targets on behalf of the Americans. One revelation that triggered outrage was that the Germans had wiretapped European companies Eurocopter and EADS for the NSA, fueling speculation over possible industrial espionage. The Americans had given their German counterparts 73 telephone numbers at both companies to monitor. BND terminated the program in 2006, because it violated German and European interests. It is now becoming clear that the BND listened in on calls associated with at least two phone numbers at the defense contractors for its own purposes, a Eurocopter office in Marignane, France, and an EADS number in Warsaw. The surveillance was so broad in scope that it forces the question of whether the targets were all actually necessary to track down terrorists and money launderers, human traffickers and arms dealers. Put differently, how many encroachments on personal data are needed to ensure security in Germany? The selectors show that part of the BND's mentality is to not trust anyone. But this lack of trust is not talked about, nor is the question of what society expects from an intelligence service, what powers it should have and where its limits should lie. As long as these questions remain unanswered, there can be no honest debate over sensibly combatting terrorism in Europe. For more than two years, a parliamentary investigative committee has been trying to shed light on the activities of intelligence agencies on German soil. But in this environment of suspicion, lawmakers are encountering one roadblock after the other in their work. Most BND employees are only willing to say the minimum required to avoid being liable to prosecution. Many are unable to remember details, many contradict themselves and some call in sick when called to testify. During the hearings, an attorney for the German Chancellery often interjects as soon as he sees a threat of secret information being disclosed. This secretiveness also pervades the debate surrounding a new BND law that would police the agency's work. The reform effort has been stalled for some time. The plans to monitor the agency are too lax for some politicians and yet too strict for others, who fear it will paralyze the BND. The skeptics have voiced their concerns behind the scenes, and Finance Minister Wolfgang Schäuble and Chancellor Angela Merkel, both members of the center-right Christian Democratic Union (CDU), have reportedly intervened. Suddenly their party is divided on the issue. From the investigative committee to the parties to the Chancellery, the case illustrates how two worlds are colliding, those of the reformers and those seeking to preserve the status quo. Gerhard Schindler is caught between the two. The BND president points to a photo of a salami sandwich in the office of a scientist in Pullach. It's his favorite image. A wrinkled white work coat is draped over a chair, a chemical formula is written on a blackboard in the background, and papers, magazines and files are stacked on brown furniture. The sandwich, still wrapped in plastic wrap, is on top of one these stacks. This is the BND to a T, says Gerhard Schindler. He's surrounded by people holding wine glasses. Schindler has come to the offices of the Gruner + Jahr publishing house in Hamburg to open an exhibition about the BND. Large images by photographer Markin Lukas Kim taken at the BND's Pullach headquarters depict the inner life of the agency. They make the BND seem very old-fashioned, like a relic from the Cold War. There aren't any people in the photos, which were all taken at night, but they depict many details. One could say that they represent the dark past of the BND. The exhibition is part of a "transparency offensive," says the president, who envisions the BND of the future as a modern intelligence service in a modern democracy. He recently ordered the elimination of the code names for BND field offices, and employees are also no longer required to conceal who they work for. Some 4,000 of the BND's 6,500 employees will soon have been moved from a hidden compound on the banks of the Isar River in Pullach to a modern, light-filled building in downtown Berlin. Images of the new headquarters are also on display at the exhibition. They could be interpreted to represent the BND's bright future. Schindler knows how long the path from dark to bright is. He mentions a "deep incision" into the culture of his agency, and a necessary "mental shift." He wants less suspicion and more discussion, as he puts it. The last few months have also taken their toll on Schindler, who was out sick for some time. Many of his employees feel unfairly criticized and let down by lawmakers. When testifying before the fact-finding commission, these agents, people who were left alone for decades as they quietly engaged in their espionage activities, are now expected to explain to the public how the BND became the NSA's willing helper. In 2002, the two agencies, still reeling from by the shock of the 9/11 attacks, signed a memorandum of agreement to engage in close cooperation, which included a jointly operated listening station in Bad Aibling south of Munich. After that, BND employees entered millions of search terms, or selectors, for the Americans into their databases -- a program the public only learned about a year ago. As we know today, the Americans palmed off thousands and thousands of search terms on the Germans that violated German interests. Over the years, the BND sorted out about 40,000 of these selectors, but the number it overlooked cannot be quantified. Some 68.7 percent of the search terms were directed against government offices of European Union partners, while many others targeted German companies. But the BND also independently spied on many targets in Europe, entirely without being requested to do so by the Americans. It wasn't until the end of 2013 that Schindler issued the order to suspend spying operations on friendly EU and NATO partners, but some problematic selectors remained active nonetheless. The Parliamentary Control Panel of the German Bundestag in charge of supervising the intelligence services appointed a task force, which paid a visit to BND headquarters in Pullach. Although the task force was shown a 900-page list of selectors, its final report remained classified. Nevertheless, some details were revealed -- for instance, that the BND was not only surveilling politicians like the French foreign minister, but also German citizens, such as the diplomat husband of Emily Haber, a state secretary in the Interior Ministry. He was head of the European Union Monitoring Mission in Georgia from 2008 to 2011. Other Germans were also on the list, including employees at EU outposts abroad. Not even German citizens were spared when it came to the agency's suspicions. The task force concluded that the BND had "spied on a large number of targets that were not in conformity with its mandate, and were legally inadmissible." How pan-European cooperation among intelligence services is supposed to flourish under these conditions remains a mystery. As long as no clear legal basis for their work exists, and as long there is no reliable supervision of their activities, a European counterterrorism program will make little progress. Every four years, the German government provides the BND with a secret mission profile detailing which issues and countries it should focus on and address. There are also three bodies that monitor the BND: the G-10 commission of the Bundestag, which consists mainly of experienced lawyers; the Parliamentary Control Panel, which meets behind closed doors; and a department at the Chancellery headed by State Secretary Klaus-Dieter Fritsche. But neither the government nor any of these bodies has learned very much about the everyday activities of BND agents, in part because no one is asking pointed questions. This, at least, might explain why Chancellor Merkel made a statement on the sidelines of an EU summit on Oct. 24, 2013 that would be remembered for years to come: "Spying between friends, that's just not done." It was a reaction to the news that the Americans had eavesdropped on one of her mobile phones. At the time, didn't she know that the BND was also spying on Germany's friends? How blind were politicians, and how ignorant? The NSA investigative committee recently held its 91st meeting inside a committee conference room in Berlin. Foreign Minister Frank-Walter Steinmeier, a member of the center-left Social Democratic Party (SPD) sat down at a semi-circular table, facing 10 members of the Bundestag in the hearing. Behind him, representatives of the federal ministries, the intelligence services and the German states observed the hearing as stenographers took notes. The foreign minister peered out a row of windows, where he could see excursion boats passing on the Spree River outside. The building's architect once wrote that his design was meant to symbolize the German Bundestag's claim to openness and transparency. Steinmeier spent more than an hour giving his opening presentation. He described the situation shortly after the 9/11 attacks, which revealed a "completely new quality of terrorism," as well as the need for close cooperation with the Americans. He said that he still supports this cooperation today. The foreign minister used his words to paint a large political picture, something he does very well. But he seems less interested in the small brushstrokes. From 1999 to 2005, Steinmeier served as chief of staff in the Chancellery under Gerhard Schröder, which also made him the BND's top supervisor. He claims that he knew nothing about problematic selectors at the time, and that he never issued any orders to spy on European partners. According to Steinmeier, he also never received any such dossiers in his later role as foreign minister. In fact, he said, he had no need for the BND's information, because he was already familiar with the European partners' political positions. Steinmeier's predecessors said similar things to the investigative commitee. In his hearing, Thomas de Maizière said that until leaving his position as head of the Chancellery in 2009, he had received no indication that the BND had entered search terms like "EADS" or "Eurocopter" for the Americans. Was the Chancellery that clueless for so many years? Internal memos show that the BND was already reporting problematic NSA selectors to a department head in the Chancellery in early 2008. Former BND President Ernst Uhrlau also told the committee that the selector problems were discussed at length in the Chancellery in 2008. Was the Chancellery head not present in that debate? Or is de Maizière simply having a memory lapse? There will be no credible responses to these questions, because the agreements between intelligence agents and their supervisors are usually verbal. For instance, no minutes are prepared for the so-called presidential group, in which the heads of the security agencies at the federal level meet in the office of the Chancellery head every Tuesday. The Americans call this method "plausible deniability." Those who leave no paper trail behind have nothing to deny. Through a lack of political leadership, the situation took on a life of its own. At the BND, it manifested itself in the unbridled collection of data. Was a shipping company suspected of proliferation, because it had once shipped goods to Iran? Should a chemical manufacturer be monitored because its products can be used to build bombs? These questions were discussed often and heatedly, say BND employees. When in doubt, however, the agents reverted to entering the surveillance target. For an intelligence service, neglecting to do something is worse than gathering too much information. The employees had little to fear from a legal standpoint. The BND operates largely without binding rule. The BND law enacted in 1990 consists of 12 sections, which are intended to create a framework for the agency's operations. But when it comes to conducting surveillance abroad, one of the BND's main tasks, it operates largely outside the confines of German law. The BND also violated the rules in its thirst for data. This is evident in its forwarding of raw data to the Americans, which was even automated in 2002. Internal documents show that at that point, BND offices had long known that these activities were partly opposed to German and European interests. But the BND brushed aside the concerns -- and used a bizarre justification to do it. According to an expert report, the "deliberate disclosure" of such data is "illegal," but through the use of a filter, the BND documented its intention not to pass any sensitive data from Germany or Europe to foreign intelligence services. It neglected to mention that this filter didn't work very well from the start. It is legally "unobjectionable," according to the report, if the automatic sharing of data "is to be viewed as being of greater value" than the isolated forwarding of "information about German citizens." In other words, close cooperation with the NSA was more important than protecting the constitutional rights of German citizens. Schindler's agency even wanted to give itself a carte blanche of sorts for intercepting satellite communications. The BND law is invalid in orbit, the agency wrote in a memo dated 11/25/2014, explaining its so-called space theory to the Chancellery. A department head working for Chancellor Merkel retorted that she considered the BND's argument to be "hardly acceptable." As these examples show, government supervision of Germany's intelligence services has failed. In response, the SPD parliamentary group presented the key parameters of a reform of the BND in June of last year, and seven months later, many of those ideas were incorporated into a draft bill that emerged from the Chancellery. Under the proposed legislation, not just Germans but all citizens and institutions in the EU would be placed under special protection against surveillance in the future. The BND president would be required to sign off on critical surveillance operations. The draft law also calls for an external panel consisting of several units that would monitor BND activities more closely. The domestic policy experts of the government coalition in Berlin quickly agreed on the basic elements of the proposal, and Schindler also agreed. The draft law, says Karlsruhe constitution law expert Matthias Bäcker, will at the very least create a framework for the BND's work. Although Bäcker criticizes some provisions as too vague, he believes that on the whole the effort is an attempt to provide BND employees with greater legal security. Nevertheless, the reform still has a long way to go before implementation. Talks within the government coalition have been bogged down for weeks, because the CDU is divided. Domestic policy expert Clemens Binninger, who is also the chairman of the Parliamentary Control Panel, supports the draft put forward by the Chancellery. In contrast Patrick Sensburg, chairman of the NSA investigative committee, proposes that an outside control committee should "report regularly to the Chancellery." Other politicians with the CDU and its Bavarian sister party, the Christian Social Union (CSU), would rather see the BND left as it is. "The necessary reform cannot become a bone of contention in the CDU/CSU," says Burkhard Lischka, the domestic policy spokesman for the SPD parliamentary group. He is calling on the coalition partners to complete the legislative procedure. The opportunity "to place the intelligence service on a modern and clearly constitutional basis" should not be squandered, "especially not in times when we face the threat of attacks and we need our intelligence agencies to cooperate in partnership." The draft bill was originally slated for debate in the German parliament, but it has been put on ice for the time being. Once again, suspicion has prevailed. As the labor participation rate and employment to population ratio linger near three decade lows, the mouthpieces for the establishment continue to perpetuate the Big Lie this is solely due to the retirement of Boomers. It's their storyline and they'll stick to it, no matter what the facts show to be the truth. Even CNBC lackeys, government apparatchiks, and Ivy League educated Keynesian economists should be able to admit that people between the ages of 25 and 54 should be working, unless they are home raising children. In the year 2000, at the height of the first Federal Reserve induced bubble, there were 120 million Americans between the ages of 25 and 54, with 78 million of them employed full-time. That equated to a 65% full-time employment rate. By the height of the second Federal Reserve induced bubble, there were 80 million full-time employed 25 to 54 year olds out of 126 million, a 63.5% employment rate. The full-time employment rate bottomed at 57% in 2010, and still lingers below 62% as we are at the height of a third Federal Reserve induced bubble. Over the last 16 years the percentage of 25 to 54 full-time employed Americans has fallen from 65% to 62%. I guess people are retiring much younger, if you believe the MSM storyline. Over this same time period the total full-time employment to population ratio has fallen from 53% to 48.8%. The overall labor participation rate peaked in 2000 at 67.1% and stayed steady between 66% and 67% for the next eight years. But this disguised the ongoing decline in the participation rate of men. In 1970, the labor participation rate of all men was 80%, while the participation rate of women was just below 43%. Then Nixon closed the gold window, setting in motion a further debasing of the currency, unleashing politicians to promise voters goodies without consequences, and giving Wall Street bankers and Madison Avenue free rein to use propaganda to bury Americans in debt, while convincing them trinkets and baubles were actually wealth. The relentless inflation released by Nixon and the Federal Reserve, and perpetuated by Washington D.C. politicians, forced more women into the workforce over the next 30 years, as families could no longer make ends meet with just the husband working. Over the next 30 years the labor participation rate of women soared to 60%, with the expected negative consequences from having tens of millions of children raised by strangers rather than their mothers. The resultant decline in the family unit and kids being brainwashed by government public school indoctrination has left generations of non-critical thinking zombies, easily manipulated by emotional appeals and false storylines. As women entered the workforce in great numbers, the participation rate of men gradually declined from 80% to 75% by the 2000. It then began a rapid descent and accelerated after the Federal Reserve created 2008 financial disaster. It now stands at 69.3%, just above its record low in 2015. In the 1950's when 87% of men participated in the labor market, the country's economy grew strongly, we produced rather than consumed, we saved before we spent, the family unit was strong, and men's purpose in life was clear. When over 30% of working age men aren't participating in the labor force, trouble is brewing. It's even worse when you consider the 25 to 54 year old male participation rate has declined from 97% in the 1950's and 1960's to below 88% today. Much of the anger building in this country is the result of men in their prime earning years seeing their jobs shipped overseas, outsourced, or taken by HB1 workers. The backlash against illegal immigrants is understandable. Then there are the young men aged 16 to 24, who have seen their participation rate fall from over 70% in the early 1990's to below 51% today. The 70% participation rate was consistent from the mid 1970's through 2000. The precipitous decline is not due to mass enrollment in college, as college students worked when I was their age. There is nothing more volatile than millions of unemployed young men, an imploding economy, growing wealth inequality, and porous borders allowing millions of illegals to invade the country, taking jobs and straining the already bankrupt social welfare net. The facts obliterate the false storyline of Boomers retiring as the primary cause for the labor participation rate plummeting to three decade low levels. In fact, the number of full-time workers over the age of 55 numbered only 11 million in 2000, representing 18.6% of the over 55 population. Today, over 21 million full-time employed over 55 year olds, represent close to 25% of the rapidly growing over 55 year old category. The overall labor force participation rate of the over 55 population, which had lingered in the 30% range from the mid 1980's until the mid 1990's, now stands just above 40% at levels last seen in the early 1960's. The Boomer retirement meme, peddled by the corporate media, is pure propaganda designed to obscure the fact millions of people, especially men, in their prime working years are not working. The fact is there are 253 million working age Americans and 102 million of them are not working. Of the 151 million working Americans, only 123 million are employed full-time (now 35 hours, then 40 hours), 10 million are self-employed, 7 million work multiple jobs, and 21 million produce nothing as they work for the government. The strong and growing job market mantra being sold to the American people is a complete falsehood, and average Americans know it. We know 10,000 Americans per day are turning 65 and will be for decades to come. Some of them are retiring as they had planned for the last 40 years to do. The fact is very few planned. They were sucked into the easy debt vortex sold by the establishment and lived in the present, never planning for the future. When 50% of all households over the age of 55 have $12,000 or less in retirement savings, they aren't retiring. When even the over 55 households that did save only have $100,000 of retirement savings, they aren't retiring. That will last them a couple years at most, when their life expectancy is 20 to 30 years. Very few households can survive on their Social Security pittance, as Yellen and her band of merry men provide 0.25% returns on savings and the cost of food, rent and healthcare surge ever higher. Boomers aren't retiring en mass because they can't afford to retire. The labor participation rate of the younger generations is being negatively impacted by the non-retirement of Boomers. This is called the trickle down effect from unintended consequences. The establishment has strip mined the wealth of the country, leaving a barren wasteland in its wake, creating a seething populace, seeking perpetrators to blame. The populist uprising which propels Trump and Sanders has been spurred by the destruction of the working middle class as the corporate fascists, global elite, and banking cabal have pushed their game of financialization roulette to its limit. The corporate mainstream media machine, whose job is to keep the establishment in power, scorns Trump when he references a true unemployment rate above 20%, while the BLS reports a beyond laughable rate of 5%. In fact, 24% of all Americans between the ages of 20 and 54 are not working. In fact, 18% of all American men between the ages of 20 and 54 are not working. What are these 13 million men doing on a daily basis? They aren't retired. A large percentage have been screwed over by a system designed to enrich the few at the expense of the many. Of the 35 million 20 to 54 year old Americans not working, many have found they can suckle more from the welfare and disability systems than they can by working. This generates animosity between the middle and lower classes, to the delight of the ruling class, as it takes the focus off their never ending criminal activities. I'm as mad as hell and I'm not going to take this anymore!!! The effort to impeach President Dilma Rousseff is a sign of a maturing democracy. Framing the effort to remove her from office as undemocratic is Ms. Rousseff’s best hope for political survival—if you don’t count buying allies in Congress. It’s also ridiculous. The impeachment petition has been in Congress since last year. But on Tuesday the Brazilian Democratic Movement Party (PMDB) quit the president’s governing coalition, raising the odds that it will go forward. The PMDB is reacting to a popular outcry against the president. She is alleged, among other things, to have violated the country’s fiscal responsibility law with stimulus spending during her re-election campaign, then of using creative accounting to hide it. Last month some three million Brazilians took to the streets to call for her removal. Last week the country’s bar association filed its own petition with Congress requesting impeachment. Brazil’s economic outlook is grim, and the recent discoveries of rampant corruption are demoralizing. But it can take a crisis to bring about reform, and the nonviolent, popular pushback is notable. The call to impeach is a sign of a maturing democracy in which civil society is confident enough to rise up against the political class. This vitality is aided by three relatively recent developments: the end of hyperinflation, the exchange of ideas and information on social media, and the ability and willingness of prosecutors to use plea bargains to investigate organized crime. Ms. Rousseff took office on Jan. 1, 2011, succeeding her mentor, Lula da Silva. In his second four-year term, Mr. Silva gradually undermined the modernization of the economy begun by President Fernando Henrique Cardoso (1995-2003). He also spent heavily to get Ms. Rousseff elected. She inherited a nation with rising expectations and declining prospects for meeting them. Her economic policies were no better than Mr. da Silva’s. By June 2013, large protests erupted around the country against government spending on World Cup stadiums while hospitals and roads deteriorated, and economic growth and investment slowed. Ironically, Ms. Rousseff escaped that bind when a smaller, hard-left minority infiltrated the peaceful demonstrations, destroying property and blocking roads. As I noted at the time, the large crowds were angry with the government but wanted no part of the violence organized and executed by disaffected radicals who sought anarchy. So the demonstrations waned and calm returned. But resentment against Ms. Rousseff continued to simmer. Since then government prosecutors have uncovered a web of pay-to-play corruption schemes involving the PT and other political parties. A number of former executives at the state-owned oil company Petrobras PBR -0.19 % and in the construction industry are caught up in the scandals. On Friday federal police arrested two former PT officials. One faces corruption charges; the other is expected to be questioned about Petrobras contracts and bribery. Before gaining the power to strike plea bargains in 2013, prosecutors had few tools available to squeeze lower-level criminals in order to bust those further up the chain of command. Now accomplices who can provide evidence about their bosses can have their sentences reduced. Apparently this has boosted cooperation. The work of these prosecutors and judges also demonstrates independence within Brazil’s judiciary. The economy is sinking. In 2015 GDP contracted by 3.8%. This year it is expected to shrink by more than 3%. According to John Welch, a managing director at Canadian Imperial Bank of Commerce Capital Markets, unemployment is 9.5% and rising. He also says the fiscal deficit for 2016 is expected to be above 10% of GDP and inflation is running at 10.4%. Those crowds in the streets are mostly the nation’s middle class, which knows that without stability and growth their aspirations remain dreams. Corruption scandals linking politicians and corporate fat cats during an economic decline hurt any government. But social media has exacerbated the pain. Brazilians once relied on traditional media outlets, which are dependent on government advertising to stay afloat. That led to self-censorship. Now the news breaks through the Internet and traditional outlets either cover it or face irrelevance. On March 30 the online media outlet “The Antagonist” boasted on its blog of getting 200 million hits per month. It noted that the online version of Folha de Saõ Paulo, the country’s largest newspaper, has 286 million hits per month. Brazilians are proud of having emerged from a military dictatorship in 1985 and they believe deeply in elected government. But they also believe that a ballot-box victory is not a blank check and that presidents should be accountable. The clean up of Brazilian politics is far from over and Ms. Rousseff could survive. But her allegation that the use of the impeachment provision of the constitution is akin to a putsch is a sign of desperation. Now, it just so happens we are in a horrible, stupid war. They’re killing us. Just killing us. I would sue for peace, because when I sue I never settle, but if it had been up to me we never would have been here to begin with. I would have negotiated, and I wouldn’t have risked the country over a few slaves, who some of them might be good people — I had some nice African-American ladies working for me, and they were very dependable ladies — but it’s dumb to risk the whole country for political correctness. It really is. The blacks love me, by the way. Frederick Douglass has been to my house. these hands? You bet there isn’t. BERLIN – Relations between Europe and Turkey have long been characterized by a deep contradiction. Whereas security cooperation (especially during the Cold War) and economic ties have been strong, the vital foundations of democracy – human rights, press freedom, minority rights, and an independent judiciary to enforce the rule of law – have remained weak in Turkey. History, too, has divided the two sides, as the dispute over recognition of the Armenian genocide during World War I attests. After the ruling Justice and Development Party (AKP) assumed power under Abdullah Gül in 2002 and later under Recep Tayyip Erdoğan, these conflicts seemed to have been resolved. During its first years in government, the AKP wanted Turkey to join the European Union and to modernize the economy. And it delivered real reforms – particularly in areas, such as the judiciary, essential to progress toward EU membership. But Erdoğan always kept open a “neo-Ottoman” option, which would orient Turkey toward the Middle East and the Muslim world. That became evident in 2007, when German Chancellor Angela Merkel and then-French President Nicolas Sarkozy together de facto closed the door to EU membership for Turkey, and in a manner that humiliated Erdoğan. In recent days, however, the fraught relations between Europe and Turkey have taken a bizarre turn. The Turkish government has twice summoned Germany’s ambassador to protest against a short satirical clip about Erdoğan shown on regional German television, even demanding that the clip be banned. There can be no doubt that Turkey’s skilled and experienced diplomats understand Germans’ relationship with press freedom and freedom of opinion – fundamental values of the EU which Turkey wants to join. The question is how much of this understanding still filters through to President Erdoğan. Relations could deteriorate further this spring, when Germany’s Bundestag votes on a resolution calling for the mass murder of Armenians in 1915 to be categorized as genocide. The motion will most likely be adopted by a large cross-party majority, aggravating tensions with Erdoğan’s government. But, despite these recent conflicts, the EU and its member states must not lose sight of the fact that the decades-old partnership with Turkey is of paramount interest to both sides. Now and in the future, Europe needs Turkey, and Turkey needs Europe. The price for this partnership, however, can never be the abandonment of democratic principles; on the contrary, Turkey urgently needs to institutionalize these principles for the sake of its own modernization. What is required is to focus on sustaining the relationship and reducing tensions as much as possible. Partnership or not, Europe cannot free itself from its geopolitical neighborhood. Ever since the nineteenth century, Europe has had to deal with the so-called “Eastern question,” which at the outset concerned how to address the consequences of the Ottoman Empire’s decline. The Ottoman legacy led to several Balkan wars, which ultimately triggered World War I. Now, a century later, the Eastern question has returned to Europe, and it is just as dangerous, even if it does not currently entail any risk of war on the continent. The Balkans – an undoubtedly European region – will remain at peace as long as a belief in a future within the EU remains alive. But the Middle East and North Africa are trapped in a power vacuum, giving rise to political crises, civil disorder, war, terror, and untold losses to the economy and human welfare. America’s intervention in Iraq, followed by the weakening (whether real or perceived) of its security guarantee for the region, has led to open strategic rivalry between the leading Sunni power, Saudi Arabia, and the leading Shia power, Iran. Turkey, too, is involved in that game. Meanwhile, most Arab states are unable to provide adequate jobs and opportunities to increasingly young populations, fueling support for religious extremism. The conflict between Israel and the Palestinians is escalating once again, as is Kurdish militancy. And the fighting in Syria (and to a certain extent Iraq), by calling into question the century-old borders established under the WWI-era Sykes-Picot agreement, is destabilizing the region and fueling the seemingly endless flows of refugees making their way to Europe. Russia’s military intervention in Syria, moreover, raised the specter of a direct military clash with a NATO member state, when Turkey shot down a Russian military plane. Should the Kremlin, which has withdrawn its forces, decide to return, the risk of such a conflict, with all its uncertain consequences, would return as well. Today’s version of the Eastern question, like the century-old variant, poses enormous risks for Europe’s security. And it could easily culminate in a forsaken and alienated Turkey, isolated on the margins of both Europe and the Middle East, with its democratic potential exhausted by the irresolvable Kurdish question. Against this backdrop, a clash of values will almost certainly continue to define relations between Europe and Turkey. But, as has been true for a century, much more – both sides’ fundamental security interests – will be in the balance as well.